Since Town descended the leagues in the 2000s, our fans have looked wistfully back up the tables and, at various times, endured the sight of Plucky Scunny, Hull, Lincoln and Boston – Boston, ferchrissakes! – tauntingly shake their asses from positions comfortably above the Mariners. Some historical perspective is in order. Have t' Tahgers ever played in the top division? They have not. Did Brian Laws take the Iron to two FA Cup semi-finals in the 1930s? He did not. Until the natural order of things is restored in the Look North eastern region, then, let us wallow shamelessly in nostalgia; and where better to start than Cod Almighty's non-exhaustive and occasionally speculative history of Grimsby Town Football Club. 1878 A group of cricketers get pissed up at the Wellington Arms and, in the absence of kebab shops and traffic cones, decide it would be a really good idea to start a football club. 1879 Quickly realising that "We are Pelham" would be a very silly chant indeed, the club discards its original suffix and adopts the name Grimsby Town. 1889 GTFC left-back Dan Doyle becomes the first Town player to kill a man, as William Cropper of Staveley FC dies the day after Doyle accidently kicks him in the stomach. 1892 Founder members of Division Two. First game a 2-1 win over Northwich Victoria (as they were known before the advent of spellcheckers). 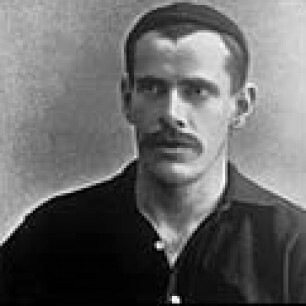 1896 Town's Tommy McCairns scores six goals in one match, against Leicester Fosse. 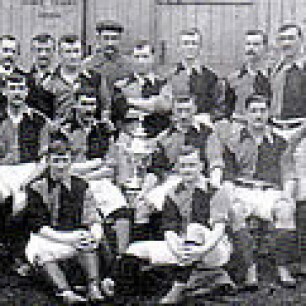 1899 First match at Blundell Park, a 3-3 draw with Luton(the 1899-1900 team pictured left). Balti pies are unavailable at the kiosk. Record victory, 9-2 against Darwen FC. Disillusioned spectators are heard to complain: "This is rubbish, Town – we should be beating these at least 23-0." 1903 Cheesed off with having to cross the Pennines once a season, Everton, Bury and Blackburn conspire in the infamous 'Lancashire Ring' scandal, fixing matches to ensure Town's relegation from the top flight. A Blackburn official is banned from football for life but the relegation is allowed to stand. 1904 Club officials decide the team's chocolate-and-blue-quartered shirts look stupid, and change the team colours to salmon pink. 1910 Thrown out of Football League, possibly as a result of crimes against fashion. 1911 Return to Football League at expense of Lincoln City. First 'foreign' signing, German-born Max Seeburg. Blundell Park 'faithful' establish a tradition as Chelsea lead 1-0 with three minutes of a game remaining: all but a few of the 7,000-strong crowd stick around to witness Town overturn the deficit, the rest presumably wishing to beat the queues for a Happy Meal. 1914 Four weeks before the new season, the Football League committee decides that the "minor affair" of war in Europe will be "over in months" and lets the new season start. Many locals find the perfect reason to excuse themselves from a torrid season for Town by signing up for the navy. 1919 Eighty-one years before Lennie Lawrence becomes manager, someone points out that, even though Town were playing in a weird temporary wartime league thing, using 192 players over the last four seasons might not be the best way to ensure stability. 1920 Spared non-League status by formation of third division. Board responds to fans' wishes by relinquishing control of team affairs to a manager, Haydn Price. Price resigns three months later, citing interference by the board in his team selections. Board resumes control of team affairs. 1921 After four months of insipid form and committee-driven football, George Fraser is appointed manager. Spared bankruptcy by sale of future England international Harry Storer (right) to Derby for a then club record of £4,500. 1924 Fraser resigns, citing interference by the board in his team selections. 1927 Supporters dig deep to help the club buy the previously leased Blundell Park, a move initiated by the board. 1928 On the final day of the season Joe Robson nets a three-and-a-half-minute hat-trick. Typically, Town lose 6-4. 1929 First recorded instance in national press of the phrase 'unfashionable Grimsby', as Town storm up the second division with 12 wins in 13 games. Title decided in a final-day showdown between GTFC and their challengers Middlesbrough. Town lose 3-0. 1931 Record league defeat, 9-1 away at Arsenal. Manager Wilf Gillow is advised by disgruntled travelling fans to "sort it". 1933 Beat Manchester United 7-3 on Boxing Day. It is not yet known whether large numbers of children attended United's next home game wearing Grimsby Town shirts. 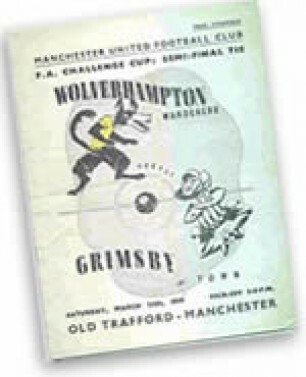 1939 Second FA Cup semi-final in four years, against Wolves at Old Trafford (programme pictured). The crowd of 76,962 remains a stadium record, and 65 years later Manchester United are increasingly desperate to stick in a few extra seats and end their embarrassment. 1948 Statistically the worst supported club in Division One for the past 13 years, Town are relegated from the top flight for the last time. 1953 Manager Bill Shankly (left)leaves for Workington, bemoaning the directors' unwillingness to invest in the team. 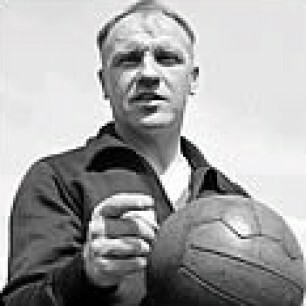 Never again will Shankly guide a team to the giddy heights of runners-up spot in Division Three (North). 1955 Kendal FC (then known as Netherfield AFC, fact fans) register a record attendance of 5,184 during a first-round FA Cup tie against the Mariners. 1956 Most ever victories in a season for Town (31) secure Division Three (North) championship; fans probably boo wins by a single-goal margin. GTFC director Arthur Drewry becomes chairman of FIFA but foolishly spurns opportunity to abolish relegation for teams called Grimsby. The brilliantly named Roy Player makes his first-team debut. 1958 First tour abroad: three weeks in Czechoslovakia. Opening 1-1 draw against Czech national side marks Town's first live TV appearance. On returning from the tour, Johnny Scott joins up with the Northern Ireland team and makes two appearances in the World Cup, the only Mariner ever to do so. 1960 Club embarks on daring three-year stint in white shirts, red shorts and red socks. Well, it was better than pink. Unless they put them all in the same wash.
1961 Pontoon stand opens, built with money given by Town fans. 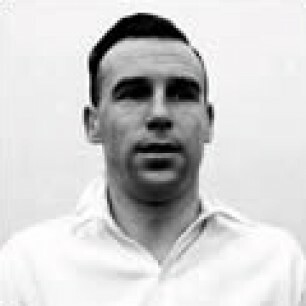 1962 Manager Tim Ward (pictured in his playing days)leaves for Derby, having just guided Town to promotion to Division Two, describing the hotseat at Grimsby as "a two-year job". 1964 Relegated to the third division on goal average, by the margin of 0.045 of a goal. 1967 Average attendance falls below 5,000, fans excusing themselves due to "lack of trust in the board". 1968 Fans prefer slide rules to radios on the final day of the season again as Town are relegated to the fourth division on goal average – this time by the gnat's-fart margin of 0.008 of a goal. 1969 Finish second from bottom of the entire League. Re-election secured, possibly by sending free boxes of fish to other clubs' chairmen. 1973 Manager Lawrie McMenemy leaves for Southampton, his grand total of one promotion being enough to get a club restaurant named after him three decades later. Watford fan Elton John releases the album Caribou, featuring a song called 'Grimsby': "I have loved every sluice in your harbour," croons Elt, perhaps euphemistically. 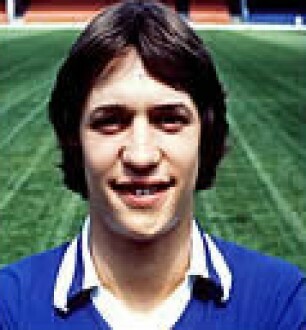 1978 Club baulks at the £30,000 transfer fee quoted by Leicester City for the services of a young striker named Gary Lineker (left). 1979 Manager John Newman leaves for Derby, having just guided Town to promotion to Division Three. The sea wall is built on the coast running past Blundell Park. Veterans claim that the pitch's drainage hasn't been the same since. 1980 Second straight promotion as opposition goalkeepers dazzled by Mike Brolly's shiny bonce. 1981 Third straight promotion missed by five points after one win in last seven games. Findus stand opens, built with money given by Findus, which becomes Town's first kit sponsor and has its name printed vertically on the front of the shirt. 1982 Cup glory and dreams come true for GTFC as the side lifts the world-famous League Group Cup in its inaugural season, ignored by a global TV audience of billions. 1985 Manager Dave Booth leaves for the Spanish timeshare holiday industry, having taken the Mariners to their highest final league position since 1948 (fifth in Division Two). Eighteen months later Booth returns to football to manage Darlington, and fails abjectly. 1988 Calamitous second straight relegation. Town's Don O'Riordan named third division defender of the year. John Cockerill scores directly from a corner, enough to knock Wolves out of the FA Cup. 1989 Harry the Haddock fails to help Town as they go down 3-1 to FA Cup holders Wimbledon in the fifth round. Around two thirds of the 12,517 crowd at Plough Lane are Town supporters. 1991 Second straight promotion secured by John Cockerill's last-day double against Exeter, prolonging respectability of mullet hairstyle on South Humberside. 1992 A group of Sunderland fans form the Jim Dobbin Appreciation Society after the Town midfielder's Radfordesque last-minute clincher at Newcastle brings to an end the home side's epic 12-match winning run. "Flipping heck!" observes a Mr K Keegan of Tyneside. 1995 Brian Laws attracts new levels of national interest in the Mariners by signing Italian European Cup finalist Ivano Bonetti (left). 1996 Brian Laws attracts new levels of national opprobrium to the Mariners by throwing a plate of chicken sandwiches at Italian European Cup finalist Ivano Bonetti(after picture on left was taken). 1998 April: 35,000 Town fans attend Football League Trophy victory over Bournemouth at Wembley. May: 25,000 Town fans attend promotion play-off final victory over Northampton at Wembley. August: fewer than 3,000 Town fans attend League Cup tie against Preston at Blundell Park. 1999 Club takes New Zealand international keeper Jason Batty on trial, just to pacify bonkers ex-pat who thinks he's discovered the new Lev Yashin. 2000 Still in the second flight, the club sacks its most successful manager ever, Alan Buckley, after the second game of the season – a 1-1 draw away at Portsmouth. 2001 Remarkable (and barely reported) 2-1 League Cup triumph at Liverpool is one of only three wins in 32 games stretching from September until February the following year. 2003 Successfully drag Sheffield Wednesday down to the third division with us. 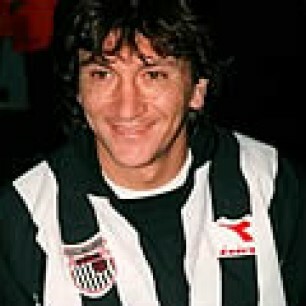 2004 Calamitous second straight relegation, under Nicky 'Ugly' Law, is the 13th demotion in Town's history. In senior English football only Notts County have been relegated more, and that's only because they're the oldest club in the League. 2010 Club chairman and Conservative councillor John Fenty oversees a third relegation as Town drop out of the Football League for the first time in a hundred years. 2016 Town whack Forest Green at Wembley and secure a return to the League, thanks in no small part to Podge Amond's 30 goals. Every single outfield player from the most successful and charismatic GTFC squad in a generation will leave the club within a year. Sources: This chronology is indebted to: Who's Who Of Grimsby Town FC by Gordon Lamming; We Only Sing When We're Fishing by Dave Wherry; Reminiscences of Grimsby Town FC 1879-1912 by Bob Lincoln and Michael Robinson; Grimsby Town Football Club - An A-Z by Robert Briggs; the Grimsby (Evening) Telegraph; Sing When We're Fishing fanzine; and Dr Phil Watson. Ta.